Many Linux distributions are based on established variants of the free Linux operating system and therefore incorporate proven technology. Increasingly, however, independent Linux derivatives are being developed. These are cropping up mostly for users looking to put slim systems on older hardware. The very young Void Linux  hails from Spain, and its second version was just recently released. This distribution is intended as an all-around solution for a broad range of hardware platforms. In addition to its resource-frugal design, "The Void" distinguishes itself with a multitude of newly developed core components that extend into the package management and even the init system. Void Linux comes in variants for conventional computer systems with 32-bit and 64-bit architectures and for ARM-based computers like the Raspberry Pi. The developers have accommodated the older, ARMv6 design  for the ARM distribution. As a result, even first-generation Rasp Pis run easily with Void. The minimal hardware required for Intel-based systems would be a Pentium 4 computer with just 96MB working memory and 350MB disk space. The RAM and disk space requirements do not increase for 64-bit computers. However, the developers recommend 256MB or 512MB working memory for graphical desktops. The desktop selection is also diverse. 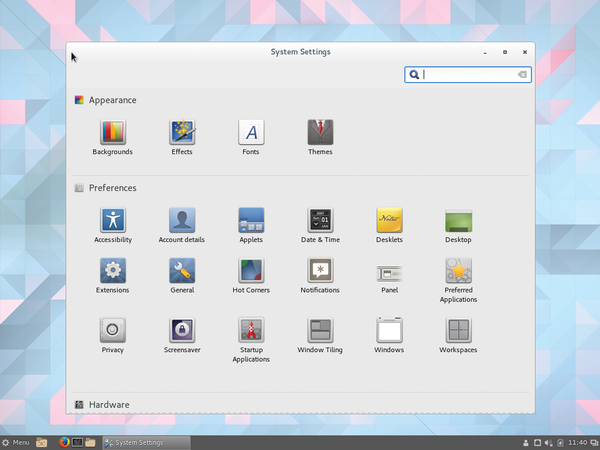 There are images that have Cinnamon, Enlightenment, LXDE, LXQt, Maté, and Xfce as their user interface. Additionally, the Void project offers images for downloading that do not have preset desktop environments. All of these images take up less than 600MB of space, making them easily burnable to blank CDs and appropriate for PCs with CD drives. Void Linux boots very quickly into a live system. The boot manager offers the option of copying the entire operating system into working memory. It is a good idea to do this when working on very old 32-bit PCs with slow optical drives and outmoded, first-generation USB connections that prevent fast starts. Once an option is selected, the system will quickly boot to a straightforward graphical interface (Figure 1). Figure 1: Void Linux starts amazingly fast even on a Cinnamon desktop. Because of the presence of resource-frugal user interfaces, Void requires relatively little memory. A test system using an LXQt desktop and 256MB main memory started up using only 110MB of memory. The heftier Cinnamon desktop also started on the same computer; however, the desktop worked very sluggishly and taxed working memory to the maximum. The Cinnamon environment was much livelier during another test performed on a single-core processor computer with 512MB RAM. Memory use totaled about 190MB, including caches. Therefore, it is probably a good idea to operate interfaces like Cinnamon, Xfce, and Maté on machines with at least 512MB of working memory. Void Linux also avoids excessive use of resources in bulk memory. Our LXQt installation made do with 950MB on the hard disk in the standard installation. Cinnamon, on the other hand, took up 1.2GB of space. As would be expected with large variations in image sizes, the available software inventory in the live versions differs accordingly. For example, LXQt uses the slim QupZilla as a web browser. Other environments use Firefox. The management tools also differ depending on the desktop. Some of these are free-standing tools. Others come from an integrated graphical program that bundles all of the settings into a uniform interface (Figure 2). 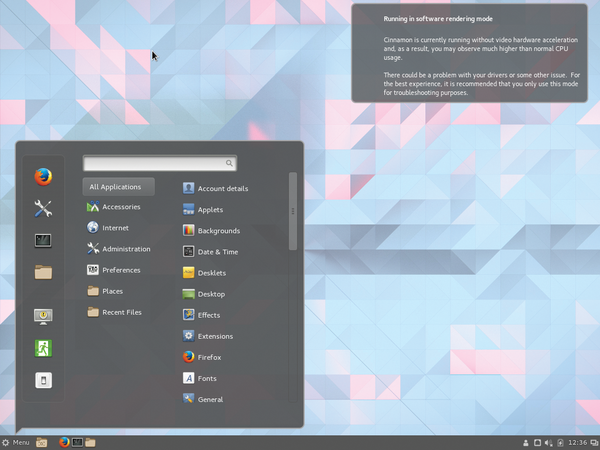 Figure 2: Cinnamon makes it easy to adjust the desktop graphically. In general, the Void variants come with considerably fewer software applications than other distributions. This spartan equipment is due to the limited size of the ISO images, because they are meant to be stored on a single CD. This means that absolutely no space remains for the large components like LibreOffice or Gimp. Even so, it is possible to generate an internet connection in each version of the operating system and load software from the repositories. By default, the individual variants feature merely two submenus, Accessories and Internet . Each only lists a few applications. For instance, the Internet submenu, without exception, only contains one web browser. The Accessories submenu is restricted to a few management programs like file managers and image viewers. However, Void comes equipped with configuration programs specific to each desktop. This makes it possible to select system-specific settings and adjust the desktop without having to load additional software from the Internet. Bedrock transparently combines virtually any number of distributions with different architectures, package management, and init systems under a filesystem.